Newly standard on all 2014 Audi S5 models are keyless entry/ignition and the Audi Drive Select system, which provides adjustable settings for the steering and transmission. Also, an optional Black Optic appearance package debuts. For most drivers, the 2014 Audi S5 is overkill, but perhaps you're the exception. Maybe you size up the S5's mainstream sibling, the generally appealing A5, and roll your eyes at its mandatory four-cylinder engine. Maybe you think a car that looks this good should hit 60 mph considerably sooner than a V6 Camry. If so, you are one of the reasons why the Audi S5 coupe and convertible exist. We should point out that the Audi S5 technically isn't the fastest A5 variant; that distinction belongs to the V8-powered RS 5 (which is reviewed separately). But if cost is at all a concern, the far cheaper S5 will be hard to turn down. Its lovely supercharged V6 pumps out 333 horsepower, eclipsing the A5's four-cylinder engine by more than 100 horses, and Audi throws in numerous other upgrades that enhance both looks and performance. Plus, the S5 substitutes a racy automated manual transmission called "S tronic" for the A5's conventional automatic. And with a nod toward the most dedicated driving enthusiasts, the S5 coupe also offers a six-speed manual transmission that's unavailable on even the RS 5. If there's a strike against the S5, it's the simple fact that there are so many tempting ways to spend this kind of money. You could go with the all-new 2014 BMW 435i, for example, which packs 300 ponies of its own. The 2014 Mercedes-Benz C350 coupe offers competitive power and luxury for thousands less, while the 2014 Mercedes-Benz E350 Cabriolet serves as a stately alternative to the Audi S5 Cabriolet. If you're feeling frisky, you could even drop the same chunk of change on the stunning new Corvette Stingray. But maybe none of these alternatives calls your name like the debonair 2014 Audi S5 coupe and convertible. Overkill? Hardly. On the contrary, it's the S5's unusually civilized blend of style and swiftness that continues to set it apart. 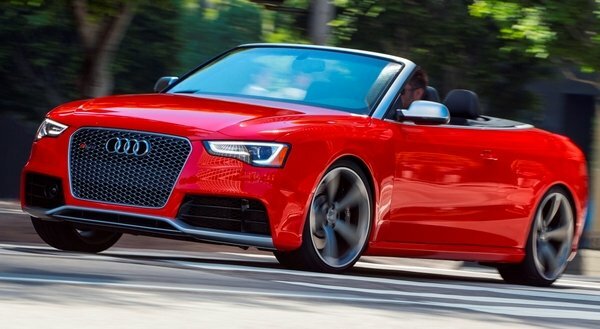 The 2014 Audi S5 is offered in coupe and soft-top convertible (Cabriolet) body styles. Both are available in Premium Plus and Prestige trim levels. Note that the Prestige is technically an option package on the Premium Plus. Standard Premium Plus features include 18-inch wheels shod with summer tires, xenon headlights, LED running lights, heated and auto-dimming mirrors, a sunroof (tilt only), a sport-tuned suspension and keyless entry/ignition. On the inside you get tri-zone automatic climate control, leather and simulated suede upholstery, heated eight-way adjustable front sport seats (with four-way driver power lumbar), driver-seat memory functions, split-folding rear seats, Bluetooth phone connectivity, a dash-mounted MMI (multimedia interface) electronics controller, a 6.5-inch display, the Audi Drive Select system (providing driver control over steering and transmission calibration) and a 10-speaker sound system with CD player, satellite radio and iPod integration. The S5 Cabriolet adds a power-operated soft top, a wind blocker and upgraded leather upholstery (going without the simulated suede inserts). The Prestige adds adaptive headlights, a blind-spot monitoring system and a 14-speaker (12 for the convertible) Bang & Olufsen sound system. Also included is the MMI Navigation Plus package, which adds the console-mounted MMI controller, a slightly larger 7-inch display, a navigation system, voice commands, front and rear parking sensors, a rearview camera, Bluetooth audio connectivity, Audi Connect (including enhanced Web-based navigation, online information services and WiFi hotspot capability) and HD radio. The optional Driver Assist package is only offered with the Prestige package equipment and includes adaptive cruise control and adaptive steering. A Comfort package is offered on both trims and adds ventilated front seats (with neck-level heating on Cabriolets). Stand-alone options include 19-inch wheels, a sport differential, adaptive dampers, a power rear sunshade (coupe only), upgraded leather upholstery, various interior trim accents and a Black Optic package that adds special 19-inch wheels, a blacked-out grille, body-color exterior mirrors (instead of the standard silver mirrors) and, on coupes, gloss-black window surrounds. The 2014 Audi S5 is motivated by a supercharged 3.0-liter V6 engine rated at 333 hp and 325 pound-feet of torque. The coupe comes standard with a six-speed manual transmission, while the Cabriolet gets a seven-speed automated manual transmission that's optional on the coupe. Every S5 features all-wheel drive. In Edmunds performance testing, an S5 convertible accelerated from a standstill to 60 mph in 5.3 seconds. Audi estimates the coupe will reach 60 mph in 4.9 seconds, which is about average for cars in this class. The manual-transmission coupe is EPA-rated at 17 mpg city/26 mpg highway and 20 mpg in combined driving. The coupe with the automated manual is rated at 18/28/21 mpg, while the convertible checks in at 18/26/21 mpg. The 2014 Audi S5 comes standard with antilock disc brakes, stability and traction control, front-seat side and knee airbags and full-length side curtain airbags (for the coupe only). A rearview camera and front and rear parking sensors are part of the Prestige package. In addition, a blind-spot monitoring system is standard on the Prestige (and optional on regular Premium Plus models), while the latter is eligible for an adaptive cruise control system that includes an audible warning and brake intervention (under 19 mph) if a frontal impact is imminent. In Edmunds brake testing, both the coupe and Cabriolet came to a stop from 60 mph in 110 feet -- a solid but unexceptional performance for a car of this type with summer tires. As expected from Audi, the S5's interior is appealing for its understated design and high-quality materials. Actual functionality, however, can be hit-or-miss. For example, the dash-mounted controller included with the standard MMI system isn't nearly as easy to operate as the console-mounted controller you get with the upgraded MMI Navigation Plus system, which also features simplified menus. The S5's standard front sport seats are quite comfortable on long road trips, yet they also provide plenty of lateral support to keep you planted in corners. The lack of head- and legroom in the rear seats, on the other hand, makes them suitable only for smaller passengers or cargo. Thanks to its space-efficient soft top, the Audi S5 Cabriolet requires few practical compromises relative to the coupe. The tight-fitting, multilayer top requires only about 15 seconds to raise or lower, and it's so well insulated from noise and weather that you may forget you're driving a convertible. With the top stowed, the convertible's trunk can still accommodate 10.2 cubic feet of cargo, which is only 2 cubes less than that of the coupe. Like the coupe, the convertible features folding rear seatbacks for added convenience. Power from the S5's supercharged V6 is plentiful, and unlike many V6s, this one is virtually vibration-free, even at redline. The sport-tuned suspension gives the S5 a sure-footed character in corners, though the car feels a bit heavy near its limits, making it less of a sports car and more of a sporty touring car. That said, the 2014 Audi S5 is definitely more dynamic all-around than the A5 on which it's based. The S5's steering could use a little more communication from the tires, yet it's still very accurate. Although most coupe buyers will opt for the automated manual transmission for the sake of convenience, those who choose the stick shift will be rewarded with precise, positive action through the gates. As for the automated manual (which takes the place of a conventional automatic transmission), it's one of the best, reacting smoothly to commands and executing rev-matched downshifts with clinical perfection. Even with the Audi S5's sporting personality, ride quality remains quite pleasant. Whether you're driving on a twisty mountain pass or in the midst of a cross-country trek, this handsome two-door proves a worthy traveling companion.